(Reuters) - Democratic U.S. Senator Kirsten Gillibrand will deliver a fiery first speech as an official presidential candidate in New York City on Sunday, calling U.S. President Donald Trump a "coward" at the doorstep of one of his most famous properties. The location in front of Trump International Hotel - which she plans to call a "shrine to greed, division and vanity," according to excerpts from her prepared remarks - is intended to show voters that Gillibrand will attack Trump directly, in contrast to some Democratic rivals who have hesitated to focus on the Republican president early in the 2020 campaign. "President Trump is tearing apart the moral fabric of our country," she plans to say. "He demonizes the vulnerable and he punches down...Our President is a coward." While some candidates, most notably Vermont Senator Bernie Sanders, have harshly criticized Trump, others have largely avoided using his name, as Democrats try out different tactics for confronting the divisive president. "She's trying to differentiate herself from the field," said Maria Cardona, a former senior adviser to Hillary Clinton. "It's a pretty crowded field. She's not really in the middle of it, and she needs to be in the middle of it." Though Gillibrand launched her formal campaign for the Democratic nomination only a week ago, she announced she was exploring a candidacy in January and spent the last two months visiting states such as Iowa, New Hampshire and South Carolina that will hold early nominating contests next year. But she has struggled to build momentum among a group of more than 15 announced and potential candidates, including five other sitting senators and former Vice President Joe Biden, who has not yet decided but is expected to join the race. "Gillibrand simply lacks the star power or national prominence that would lead to extensive free media time," said Patrick Murray, director of the Polling Institute at Monmouth University. 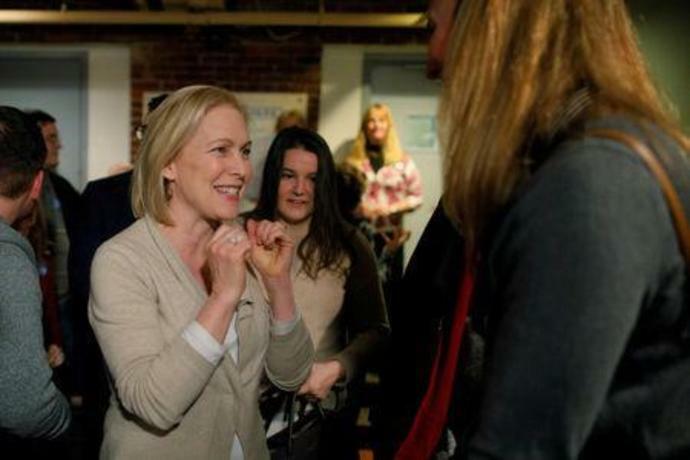 In recent surveys, Gillibrand has remained stubbornly mired in the 1-percent range, while other first-time presidential candidates like Kamala Harris and Elizabeth Warren, both U.S. senators, have shown more competitiveness. The race remains in its infancy, however, with the first nominating contest in Iowa still 10 months away. "Most voters are just learning the candidates' names," said Jesse Ferguson, a senior spokesman for Clinton's 2016 presidential campaign. "Right now, the priority for a candidate is to introduce themselves and show what their values are and how that's the answer to what we have in the White House." Gillibrand, known as a moderate when she served as a congresswoman from upstate New York, has refashioned herself into a staunch progressive, calling for strict gun laws and supporting the environmental agenda known as the Green New Deal. Some liberal activists have viewed that shift with skepticism. In recent years, she has led efforts to address sexual assault in the military and on college campuses, and she pushed for Congress to improve its own handling of sexual misconduct allegations. But she recently was forced to defend her office's handling of a sexual harassment investigation, after a former employee said her allegations against a supervisor were mishandled. The theme of her speech on Sunday will focus on what it means to be "brave." Gillibrand will argue that she has stood up against big banks, sexual assault and most importantly Trump himself, with more votes against the Trump administration than any other senator. "Symbols are powerful, and for Democratic primary voters, no symbol more clearly represents what's wrong than the icon of Trump's egotism that is Trump International," Ferguson said.